Redesigned to be sturdier than other round electric cable hatches. Vermin door will accept a 30 or 50 AMP cord. 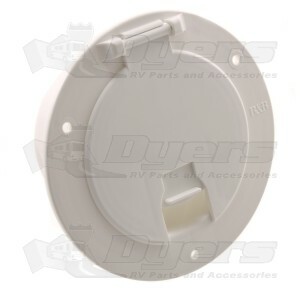 The outside collar is wider to cover up any pre-existing screw holes. The hinge is extra heavy duty. Use this when an extra sturdy hatch is required. The hatch is constructed not to fade or discolor due to weather or chemical action.